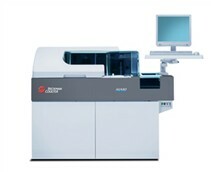 The AU480 Chemistry System maintains many features of its predecessor the AU400 that made it successful; long life electrodes, low maintenance and superior spot photometer technology. 76 positions for (R1+R2, detergent position). Lipaemia, Haemolysis and Icterus analysis. We are just new in using Beckman Coulter AU480 analyzer, and we just switch to barcode system. What are we going to do or any procedures how to run barcoded samples using AU480. Thank you. There are no threads in Beckman Coulter AU480 Reviews at this time.